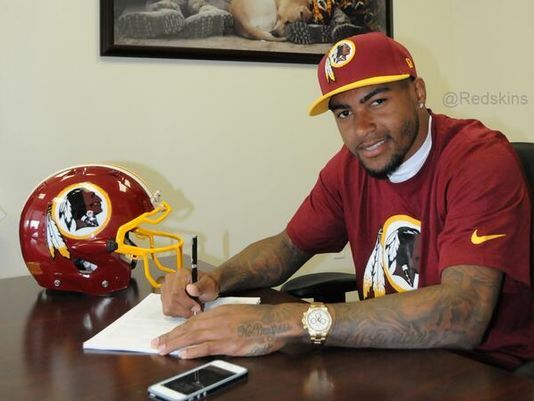 Former Eagles Wide Receiver DeSean Jackson signed a three-year $24 million contract with the Washington Redskins today. (Photo courtesy of the Official Washington Redskins Twitter account). To say that DeSean Jackson has had an eventful week is to say that Jerry Rice is an OK receiver. Less than a week after being released by the Eagles, Jackson agreed to a three-year, $24 Million contract with the Washington Redskins. Many were critical of the Eagles for releasing their best receiver, and a receiver who is coming off of his best season of his career no less. Many questioned the move and many have their reasons why. Some people have even questioned the Eagles decision to cut DeSean Jackson, yet keep, and even give a contract extension to, Riley Cooper. Cooper of course is now infamous for being caught on a cell phone camera using the N-word while drunk at a Kenny Chesney concert at Lincoln Financial Field. If you are one of those people, just stop now. Listen, there is absolutely no excuse for Riley Cooper doing what he did at that concert. Cooper was embarrassed by it, as he should have been. Having said that, he was awarded a new contract because he stepped up when he needed to last season after Jeremy Maclin suffered a season-ending knee injury and he provides some height in the red zone and is a physical presence when it comes to blocking. But I digress. There are many theories and different reasonings regarding why Jackson was released, and none of those really matter. What really matters is the Eagles’ reasoning as to why they parted ways with Jackson. When Chip Kelly came to Philadelphia, he brought with him a new system and a new style of how the team will be run. At the end of the day, DeSean, who was on thin ice years before Kelly’s arrival, did not fit into Chip Kelly’s way of running the team. After unsuccessfully trying to trade him, and ultimately not wanting to simply leave another team with dealing with the baggage that comes with him, the Eagles released Jackson, which freed up a sizable amount of cap space. His career is now on the line. Even with a slight benefit of the doubt with him entering his first year with a new team, the pressure is on. On the field he will produce, but if his off the field issues rear their ugly head and he has an unceremonious exit from Washington, it will be extremely difficult for him to find another team willing to deal with him. Worse, it could mean a short career for a promising and talented young receiver. Will it happen? Who knows. It’s all up to DeSean Jackson.